What stitches are used in point de gaze needle lace. The techniques of point de gaze needlelace. Construction of antique point de gaze needle lace. Both of the books have chapters devoted to the stitches used in certain historic needle lace styles, and both include chapters on point de gaze. Barley also gives full and detailed instructions for working some pieces of her design, for those who want to learn that form. Started by Dee K. Last reply by Lorelei Halley Nov 16, 2018. Started by Dee K. Last reply by Sue Babbs Mar 22, 2016. Started by Dee K. Last reply by Elizabeth Ligeti. Mar 14, 2016. Started by Dee K. Last reply by Dee K Mar 13, 2016. You need to be a member of point de gaze to add comments! Does anybody else get the "artefact of the month" from the Lace Guild Museum? This month it is a glorious point de gaze piece, high resolution. You can see every thread, all in focus. These are beautiful Loretta I love them both. I have been busy with other craft projects of late but really must get back to needlelace. Twisted stitch, in all its forms, is very difficult to get even and looking really nice. 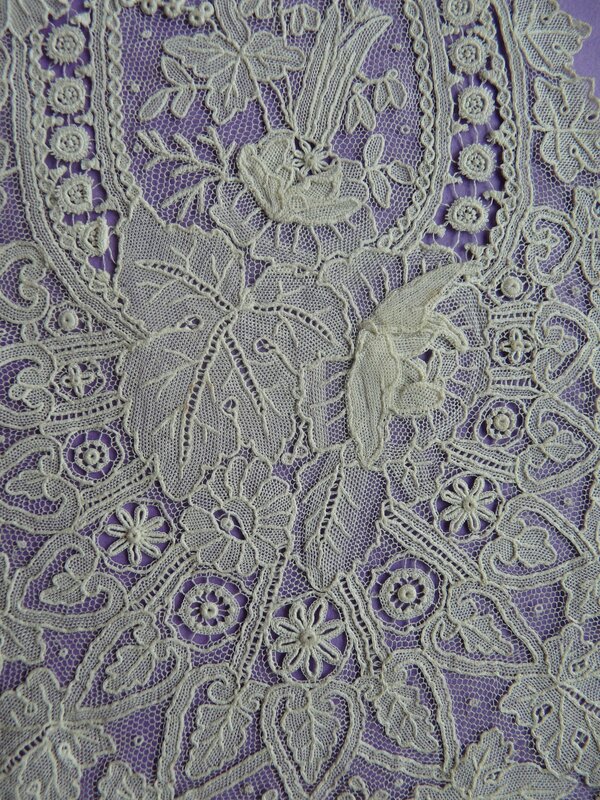 I don't know how the lacemakers who had to do lots of it for a living, managed to get it looking so even! It will always be a big challenge for me, anyway!! You are not alone, Christiane, in struggling with it! My cheat on it is to make the rest, - the main design features - be Very dominant and fairly well done, so the eye is drawn Away from the twisted ground!!! Liz. Vous m’avez bien fait rire ce matin. On peut dire une journée qui part du bon pied. Depuis trois ans que j’essaie de maîtriser une seule et même maille, le "point de feston double" et cette seule maille ne cesse de me donner du fil à retordre sous toutes ses formes. On la retrouve dans l’Alençon, le Burano, le Point de gaze, et voilà encore ce Hollie stitch qui demande son reste... Encore un autre trois ans de travail à l’horizon! Liz. You have made me laugh this morning. We can say one day that starts on the right foot. For three years I try to control a single stitch, the "twisted buttonhole stitch" and this only single stitch keeps giving me a hard time in all its forms. It is found in Alencon, Burano, Point de gaze, and yet, now, there is Hollie stitch and English stich requesting their remains with the same basic twist ... Yet another three years of work on the horizon! You are absolutely right Liz. Can't see my passion for it ever waning just because of the endless different types. No danger of me ever mastering any of it but the pleasure of the journey is enormous. Every day leads to some new discovery or nugget of information and with heaps of practise more confidence. But, Teri, the beauty of lacemaking - in all its forms, - is that there is always another type of lace to have a go at - whether with needle or bobbins!!!!!!! The 'new' sorts of lace are never ending - lets face it - we have only, in the last year or 2 'discovered' Pag lace - which has been around for Ages, - but we did not know of it! I am sure there are many others yet to be "discovered"!!! That is why lacemaking is so addictive and Never boring - new types, new techniques, etc - always! Hi Liz, wholeheartedly agree! Once something is mastered, often the fun and interest dies. have a huge membership, whom we should be encouraging to display their efforts as it is helpful to us all.